Isle of Man, Wednesday June10th, 2015 -Victory Racing is celebrating its first ever TT podium after Lee Johnston rode a 111.620mph lap in the SES TT Zero race to take third place. Victory Motorcycles has been flexing their muscles in various forms, not only by entering the Isle of Man TT, but also by taking part in professional drag racing, running a stunt team and fielding an entry in the iconic Pikes Peak Hill Climb with a prototype and custom race machine built by Victory Racing and Roland Sands Design, all which will be exhibited at the upcoming American Victory Rally in Denver and Colorado Springs, CO.
Los Angeles, April 3rd, 2015 - The FastDates.com Motorcycle PinUp Calendars is excited to announce one of their most popular Calendar Kittens Sara Horvath, together with new comer Helene Milana, both represented by Umbrella Girls USA, will be serving as the official SBK World Superbike Umbrella Girls at the upcoming Laguna Seca World and AMA Superbike race weekend July 17-19th 2015 at Mazda Raceway, Laguna Seca, CA. The SBK Kittens will also be making fan appearances in front of the Laguna Seca Paddock Souvenir Store during the Lunch Breaks on Saturday and Sunday to introduce, autograph and sell the new 2017 Fast Dates World Superbike Calendar. 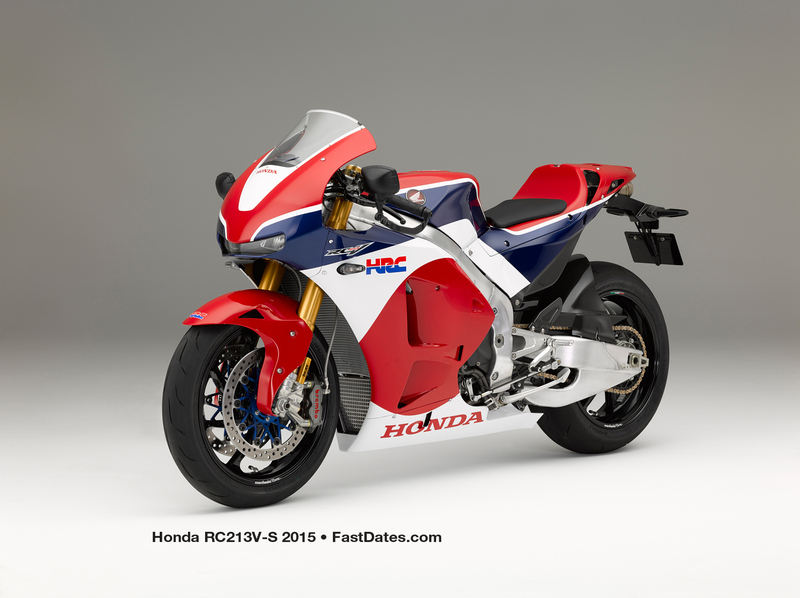 Sara and Helene will also be working the race weekend with FastDates.com Calendar photographer and publisher Jim Gianatsis to shoot the next edition of the Fast Dates World Superbike Calendar with all the top factory race team bikes on Pit Lane during the race weekend. 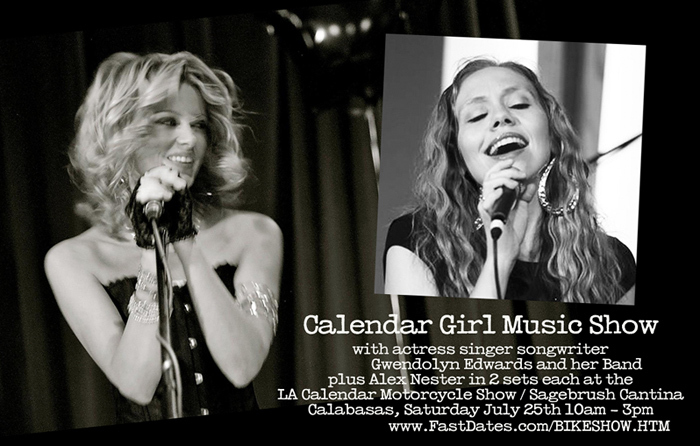 The newest FastDates.com Calendar Kitten Helene Milana, who is joining us at Laguna Seca World Superbike and the LA Calendar Motorcycle Show in July, recently moved to Los Angeles from Belarus in Eastern Europe. She has been here about a year and Jim discovered her working at a car show, was immediate impressed by her beauty and poise when he spoke to her, she looked to be a perfect match in looks and 5' 9" height to Sara, and quickly booked her for the jobs in July. We could run this same podium photo every week in our World Superbike race coverage if the track name on the back panel didn't change. 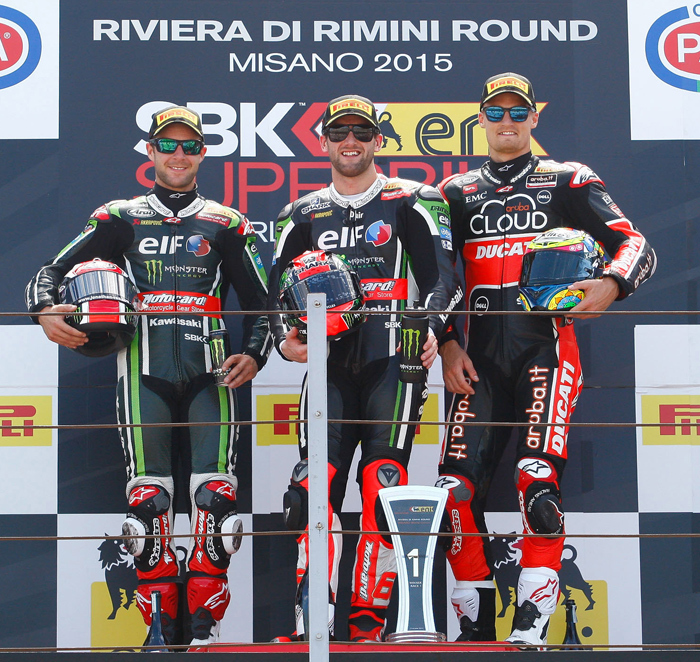 Misano podium finshers were again Jonthan Rea (65), Tom Sykes (66) and Chaz Davies (7). 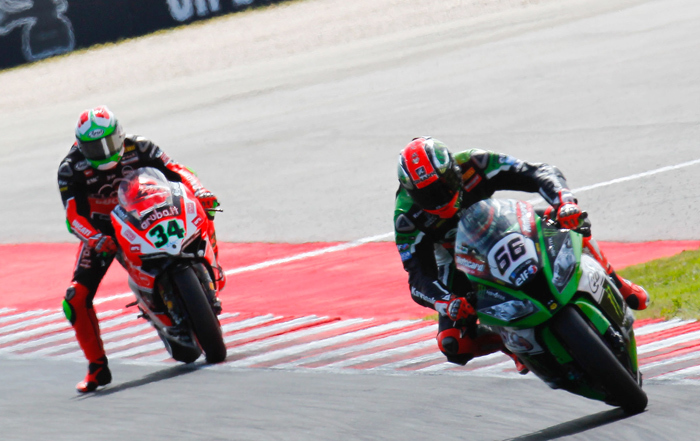 WSBK, Misano, San Marino, Italy , 21 June 2015 - First Tom Sykes (KRT) and then championship leader Jonathan Rea (KRT) scored race victories at the eighth round of the FIM Superbike World Championship at Misano today, Rea leaving with an extended lead of 133 points over his team-mate in the overall standings. In the first 21-lap race Sykes rode from pole position to the win by a margin of 3.613 seconds over Rea, after the rider from Northern Ireland had opted for a different rear tyre from all his rivals and got held up in some of the early laps. Sykes just counted the fast laps off out front to take his third win of 2015 but Rea had to fight for second in the final laps under pressure from another rider. He held on to take his 16th straight podium finish of the year. In race two there was more of a tussle for all the top riders with Rea overhauling long time leader Davide Giugliano to take the 25 points. Sykes had more difficult finding the required traction in race two, and dropped from the lead he held for six laps to finish fifth. Rea left with a new lap record of 1’34.720 after race two and a championship points score of 375 to Sykes’ 242. Sykes is now 16 points ahead of third place after eight rounds and 16 races. Rea has a new total of 26 WSB career race wins and Sykes 25. 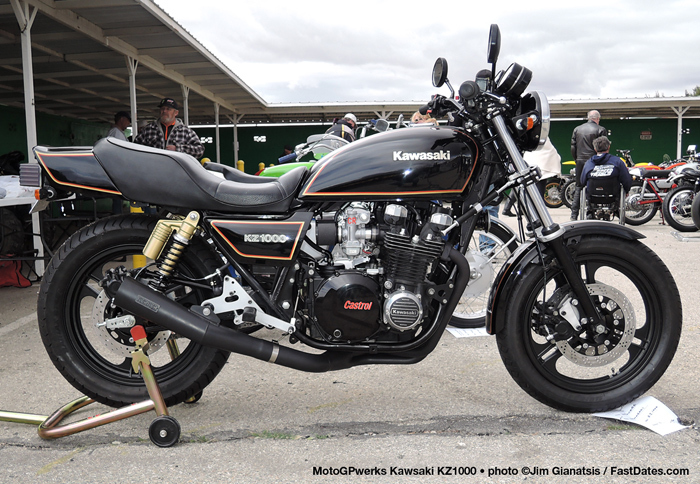 In the manufacturers’ championship Kawasaki leads by 122 points. A view of the beutiful Italian countryside from the Ducati pits. 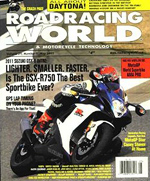 The next World Superbike race takes place at Laguna Seca, in the USA, on July 19th. David Salom (Kawasaki Team Pedercini) scored one point today in race two and Roman Ramos (Team Go Eleven Kawasaki) was 14th on two occasions at Misano. 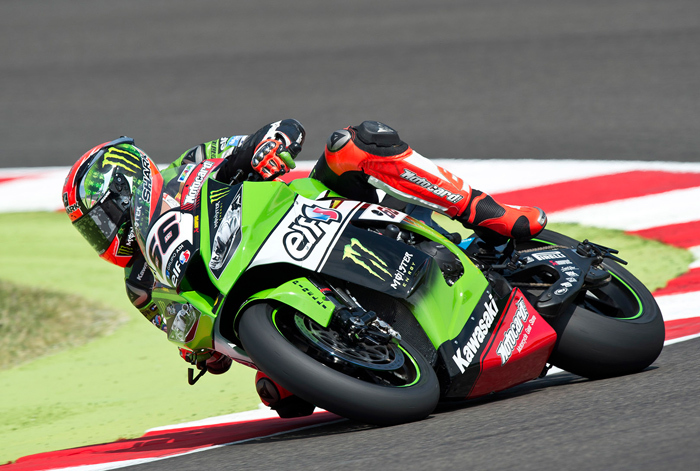 SUPEROLE Saturday 20 June 20th, 2015 – Tom Sykes (KRT) set a new track best of 1’34.214 at Misano to score his third Superpole win of the year, as his team-mate Jonathan Rea (KRT) placed fourth. Sykes had to first negotiate Superpole 1 after qualifying in 11th place after the first three timed qualifying sessions but ended up with a clear advantage of 0.212 seconds over the second placed rider after Superpole 2. Sykes was only just out of the top ten after regulation qualifying meaning he had to ride in Superpole 1 to earn his place in Superpole 2. He led this first contest on a race tyre and then used a qualifying rear tyre to make sure he entered Superpole 2. In the second Superpole sector Tom pushed on to record his new track best lap time, to his own surprise in some regards, but his start from the best possible grid position will stand him in good stead for each race on Sunday. Rea was on strong form from the start at Misano and although he missed a front row start in Superpole after pushing too hard in the first sector of his first flying lap, he is in a good starting position to take on the challenge of a newly resurfaced Misano circuit. Rea has been working through various tyre options, both front and rear, through race weekend and he will make his final race selection after morning warm-up on Sunday. 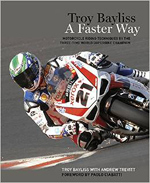 After taking his 27th career Superpole wins Sykes is now the second ranked qualifier of all time in his own right, moving one place ahead of WSB legend Troy Bayliss today. 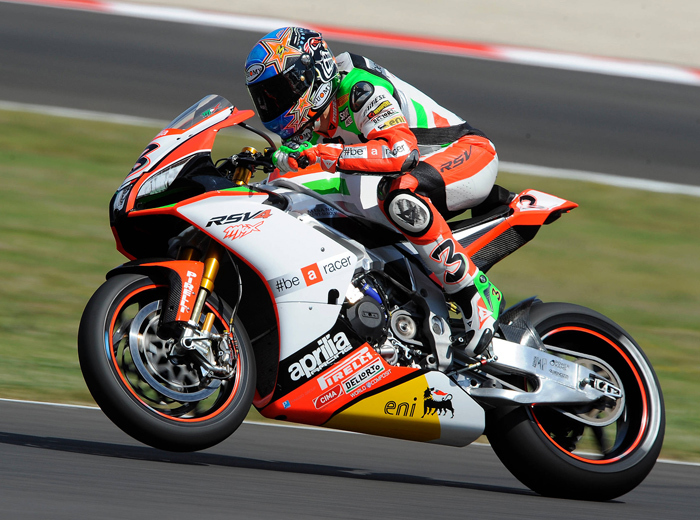 He has also scored pole at Misano in the past four visits of the WSB championship to the Adriatic circuit. At the end of an exciting Superpole, raced with record breaking laps, Aprilia placed all three of its RSV4 RFs on the first two rows, demonstrating that they will be key players in the two races tomorrow which promise to be unforgettable. With the second best time (at 1'34.426), Leon Haslam placed on the front row, an excellent performance that takes on even more value in light of the fact that the English Aprilia Racing - Red Devils rider made that time on his second lap with a qualifier tyre, forced to give up his best lap due to a mistake. Max Biaggi, on his return to racing three years after retiring, continues to astonish. After clearly dominating the free practice sessions on Friday, the six-time World Champion confirmed all of his class and his excellent form battling with the 2015 championship protagonists and taking a brilliant second row spot thanks to his fifth best time (1'34.463) just 25 hundredths from the pole. And this is in his first experience with the current Superpole format that allows only one qualifier tyre to be used, making Max's achievement in this long-awaited Misano wild card performance even more exceptional. Afther having been retired for 2 1/2 years, and inspired by Troy Bayliss' return to WSBK earlier this year, Max Biaggi thougth he would like to try a few of the nearby WSBK races as well. In Friday Practice Max posted quickest time of the day on his factory enter April, and then took 6th in Superpole on Saturday. Not bad for an old guy. Max Biaggi: "We knew that Superpole would be complicated for us. This is my first time with the new format and using a qualifier tyre on a flying lap isn't easy at all. In these conditions it doesn't take more than a small mistake to compromise all of the weekend's work and the pace is so frenetic that there is no room for indecision. I'm pleased with the placing. The gaps are very tight behind the leaders and we have also done a good job in terms of race pace. I am satisfied and my compliments go once again to the Aprilia test team which came to the track with me to Misano in race configuration. Now I'll begin to prepare for the two races tomorrow. I'm expecting a hard battle! The main goal is still to have fun and to give the fans a good time. 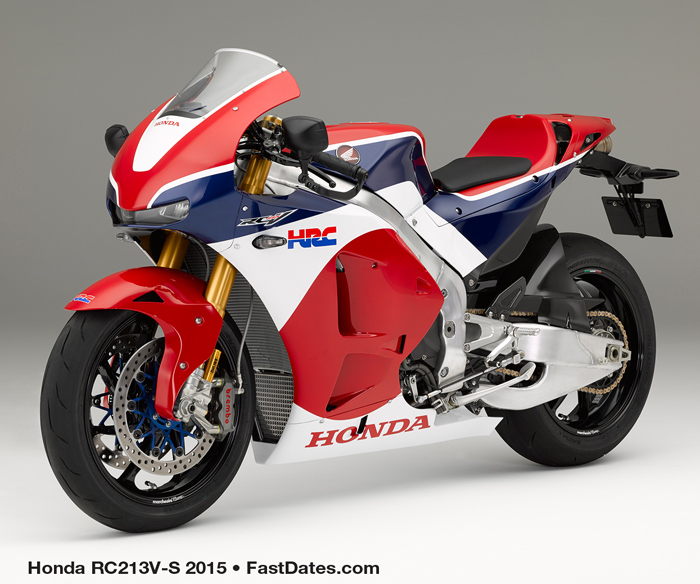 Leon Haslam: "This weekend we improved session after session. We had a good base to start from and we basically adapted the setup solutions we had tried at Portimão to make the work on this track. The track changes a lot depending on the temperature, so we tried to work quite a bit on tyre life and on consistency in the various conditions. I'm rather pleased with our level. I was the fastest one out there on a race tyre. In Superpole I made a mistake on the first turn, so I slowed down to conserve the tyre and make a go of it on the second lap. In light of this, second place and a good pace make me hopeful for tomorrow." Ducati's Davide Giugliano (34) set a new Lap Record in Race One as he tired to catch race leader Tom Sykes (66) in the opening laps, then dropped back to finish 4th. The opening race of the day at the Misano World circuit “Marco Simoncelli” was won by Tom Sykes (Kawasaki Racing Team) who converted his 27th Pole Position into his 25th career win – his third of the year in front of an enthusiastic Italian crowd. 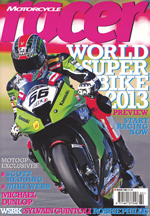 In doing so he once more tied his teammate Jonathan Rea for both number of wins and podium finishes. 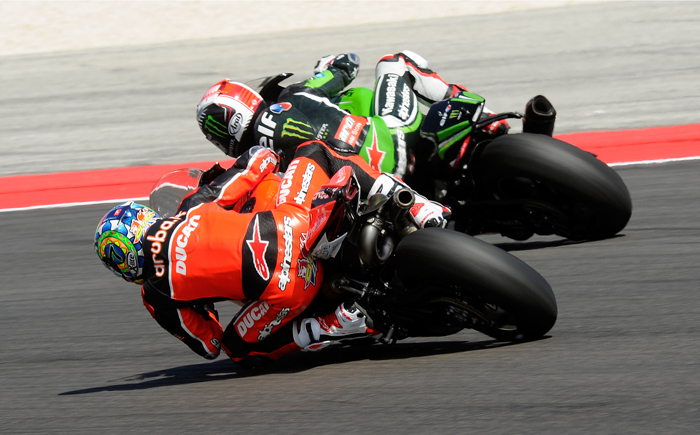 Leading from the start, Sykes led all 21 laps, coming home ahead of team mate and championship leader Jonathan Rea and Chaz Davies (Aruba.it Racing – Ducati SBK Team) who delighted the Italian fans around the circuit with an incredible final lap duel for second position. Davies lunged past Rea into the final corner only to run wide, being passed again on the run to the flag by Rea. Davide Giugliano put the second official factory Ducati into fourth, the Italian running second for the majority of the 21 lap encounter before being overhauled by the British pairing of Rea and Davies in the final two laps. He did however claim a new lap record, which he set on lap 3. Above, Chaz Davies and Jonthan Rea got by Giugliano near the mid-point of race one, and battled back and forth over 2nd place, with Rea coming out on top. Note the new Akrapovic exhauast system on Chaz's 1199R Panigale which still has twin silencars under the engine, but rather then the usual outlets at the rear of the silencers, the twin exhausts are then routed into a single up pipe on the right side of the bike. Leon Haslam (Aprilia Racing Team – Red Devils) was unable to show the pace he had in qualifying coming home fifth, 0.1s ahead of the returning Max Biaggi (Aprilia Racing Team) who had a steady ride to finish sixth. The six time World Champion survived a heart stopping moment on the opening lap when he collided with Sylvain Guintoli (Pata Honda World Superbike Team). Guintoli would eventually finish ninth after fighting for the full 21 laps with Ayrton Badovini (BMW Motorrad Italia), Michele Pirro (Aruba.it Racing – Ducati SBK Team) who finished seventh and eighth, and his own Pata Honda team-mate Michael van der Mark who finished just behind the Frenchman in tenth. The final point scorers were Leandro Mercado (Barni Racing), Alex Lowes (Voltcom Crescent Suzuki), Leon Camier (MV Agusta Reparto Corse), Roman Ramos (Team Go Eleven) and Matteo Baiocco (Althea Racing). Jordi Torres (Aprilia Racing Team – Red Devils) was running in the leading group before crashing at turn 3 on the third lap. The WorldSBK rookie was physically annoyed with himself as he walked back to the pits. Giugliano misses out narrowly on maiden victory as Haslam takes final place on the podium. The second race of the PATA Riviera di Rimini round of the eni FIM Superbike World Championship was won by championship Jonathan Rea (Kawasaki Racing Team) after a race long fight with Davide Giugliano (Aruba.it Racing – Ducati Superbike Team). Giugliano took the lead on lap 7 where he stayed until being passed by Rea with 5 laps to go. The current points leader was kept under constant pressure by the Italian, but held on to record his 11th win of the year by 1.290s. 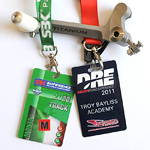 Rea’s double podium finish equals the record set by Troy Corser in 2005 of 16 consecutive podium finishes in a season. Behind the first two, Leon Haslam (Aprilia Racing Team – Red Devils) got the better of Chaz Davies on the second factory Ducati after their own personal race long duel to claim the final podium place. Eventual race one winner Tom Sykes (Kawasaki Racing Team) was strong for the first half of the second encounter before dropping back to fifth at the flag. The former champion finished just ahead of Max Biaggi and Jordi Torres, the Aprilia Racing pairing swapping places throughout the 21 laps. Michele Pirro rode a lonely race to finish eighth on the third Aruba.it Racing Ducati, with Pata Honda team mates Sylvain Guintoli and Michael van der Mark completing the top ten. The final 5 point scoring riders were Ayrton Badovini (BMW Motorrad Italia), Niccolo Canepa (Althea Racing), Markus Reiterberger (VanZon Rehema BMW), Roman Ramos (Team Go Eleven Kawasaki) and David Salom (Team Pedercini Kawasaki). Leandro Mercado’s run of point scoring finishes in every race came to an end, the Argentine rider retiring his Barni Racing Ducati at the end of lap 3. Alex Lowes (Voltcom Crescent Suzuki) was another of the riders to retire, on lap 9, while Matteo Baiocco (Althea Racing Ducati) fell off his Panigale R machine to end as the local rider’s racing weekend drew to a close on a low. Savadori (ITA) leads the way ahead of De Rosa, Coghlan, Calia. Four-way battle for the podium as De Rosa edges out Tamburini and Calia for second. orenzo Savadori (Nuova M2 Racing Aprilia) took a hard-fought win in the sixth race of the 2015 FIM Superstock 1000 Cup at the Misano World Circuit “Marco Simoncelli”, his fourth victory of the season. The tall Italian rider took advantage of the battle for second place storming behind him, which saw Raffaele De Rosa (Althea Racing Ducati) successfully defend his position despite the numerous attempts by Roberto Tamburini (Team MotoxRacing BMW) to edge out his fellow Italian rival. Kevin Calia (Nuova M2 Racing Aprilia) managed to stick with the leading trio but was unable to get into the mix for a podium finish, likewise Kev Coghlan (MRS Yamaha) who dropped back in the latter stages of the encounter after running in second for a handful of laps. The experienced Scottish rider claimed fifth place ahead of team mate Jeremy Guarnoni as Christoffer Bergman (MG Competition Yamaha), Ondrej Jezek (Triple-M by Barni Ducati), Bryan Staring (Team Pedercini Kawasaki) and Fabio Massei (EAB Racing Ducati) rounded out the top 10. With only two races to go, Savadori holds a 34-point lead over Tamburini. The FIM Superstock 1000 Cup action will resume in Jerez on September 20th. Althea team owner Genesio Bevilacqua seems a little confused which team member to grab on the starting grid at Misano. to claim his first pole position since Valencia in 2014. 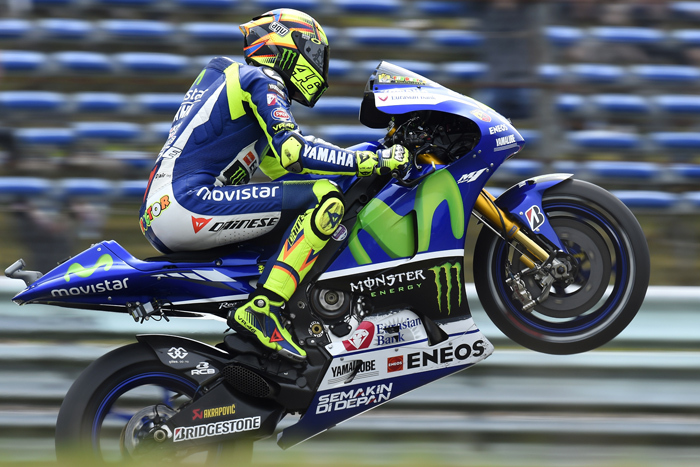 Assen, Netherlands, June 25-27th, 2015 - Movistar Yamaha’s Rossi dramatically transformed his qualifying fortunes in Assen today by demolishing Casey Stoner’s 2012 pole record by over a second to claim his 61st career pole position. 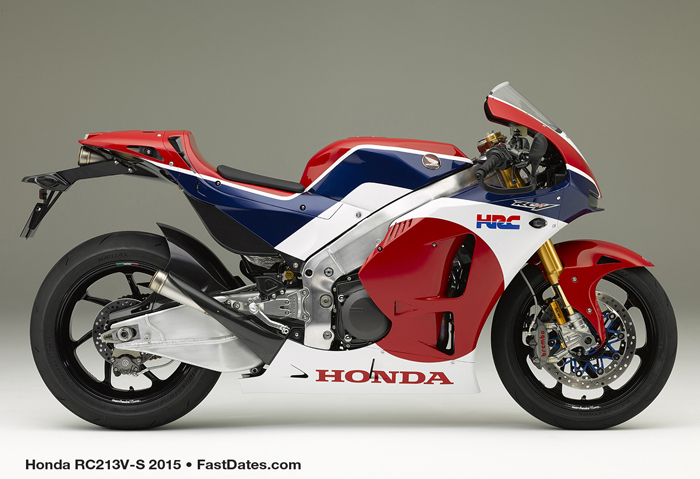 The nine-times World Champion set a 1’32.627 to become the fastest ever rider around the legendary 4.5km track. With the sun breaking through the clouds and track temperatures reaching 38°C, the scene was set for an epic Q2 at the historic TT Circuit Assen, and the fans in the packed grandstands were not left disappointed. Rossi, who admitted in the build-up to this weekend’s action that his qualifying performances have been his weakest link so far in 2015, responded in magnificent fashion to take his 51st premier-class pole position for the Motul TT Assen. The Italian had earlier finished on top of the combined timesheets after FP3 for the first time since the new two-tiered qualifying system came into place in 2013. Team Suzuki Ecstar’s Aleix Espargaro (+0.231s), who had been forced to battle it out in Q1, just missed out on his second successive pole position and will start from second on the grid.Repsol Honda’s Marc Marquez (+0.259s), who had earlier topped FP4, led the session after the first time attack on soft tyres. But he eventually had to settle for third to complete the front row. His teammate Dani Pedrosa (+0.360s) will start from the front of the second row, with Monster Tech 3 Yamaha’s Pol Espargaro (+0.386s) the leading Satellite rider in an impressive fifth. Ducati Team’s Andrea Iannone (0.389s) qualified in sixth with Cal Crutchlow (CWM LCR Honda) just 0.012s further back in seventh. Rossi’s teammate Jorge Lorenzo, the man who trails the Italian by just one point in the Championship standings, will have to start his quest for a fifth straight win from eighth. Maverick Viñales (Team Suzuki Ecstar) and Andrea Dovizioso (Ducati Team) completed the top ten. 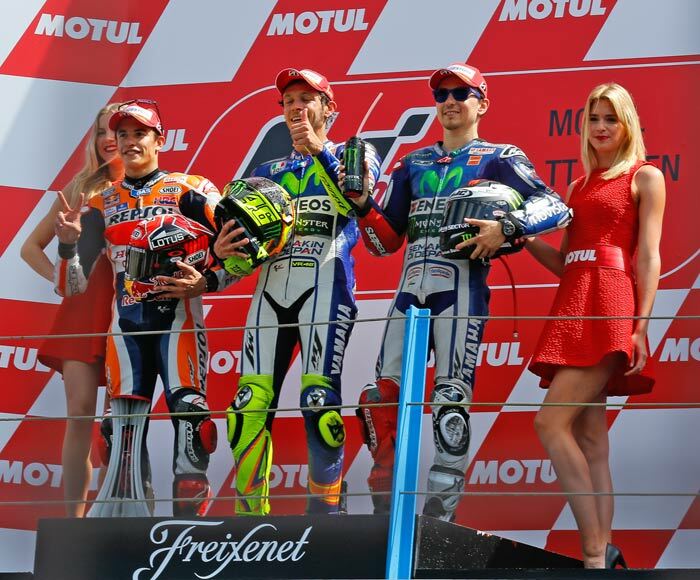 after an incredible race-long battle with Marc Marquez at the Motul TT Assen. Assen, Netherlands, Saturday, June 27th 2015 - A massive crowd of over 97,000 fans witnessed one of the greatest MotoGP™ battles ever today, as nine-times World Champion Valentino Rossi secured a dramatic last corner victory against Marc Marquez at the legendary TT Circuit Assen. After a thrilling race-long duel, Marquez made a brave move on Rossi as the duo entered the final chicane on the last lap. There was contact between the pair, which forced Rossi to run straight on through the gravel at the Geert Timmer chicane. The Italian managed managed to stay upright though and went on to take the chequered flag 1.242s ahead of Marquez, claiming his third win of the season and first from pole position since Misano in 2009. Movistar Yamaha’s Rossi, starting from pole for the first time since Valencia last season, led into the first corner and it didn’t take Marquez long to join him after starting from third on the grid, overtaking Aleix Espargaro on the first lap to move into second. On the 2nd to final lap marquz would pass Roosi for the lea, only to have Valenation take it back a few corners later. Then, going into the final chicane on the last lap beofre the finish, Marquez (93) tries a desparate late braking dive inside Rossi (46) and they collide (see above). The collision forces Valentino (and Marquez) off the track where Valention pegs the Yamaah full throttle across the gravel trap and straight onto the finish straightway to take the win (see below). Rossi’s teammate Jorge Lorenzo enjoyed a brilliant start from eighth on the grid, and found himself in third after the first lap. Any hopes the Spaniard had of making it five wins in a row disappeared shortly afterwards though, as Rossi and Marquez pulled away at the front and disappeared off into the distance. The double MotoGP™ World Champion eventually crossed the line 14.576s behind his teammate in a lonely third position and slipped 10-points behind Rossi in the World Championship standings. Ducati Team’s Andrea Iannone (+19.109s) was another four seconds back to finish in a lonely fourth. Monster Yamaha Tech 3’s Pol Espargaro won an incredible battle for fifth that saw four riders all finish within 0.4s of each other. The Spaniard also finished as the leading Satellite rider after he crossed the line just 0.105s ahead of CWM LCR Honda’s Cal Crutchlow in sixth. Espargaro’s teammate Bradley Smith was seventh in front of Repsol Honda’s Dani Pedrosa (+24.656s), who had fought back valiantly after a crash in the earlier Warm Up session and a disastrous start that saw him down in 12th after the first lap. Hector Barbera and Jack Miller were involved in a crash on the very first lap that resulted in the Spaniard having to go to the medical centre for checks on his right leg, although he was later declared free of injury. Alex De Angelis, Eugene Laverty and Stefan Bradl also crashed out; with the latter finding out he had fractured the scaphoid in his right wrist after an X-ray at the Medical Centre. Valentino Rossi, 1st - ”I pushed, and I don't want to say I did a perfect race, but close. I saw I was not able to get distance from Marc. It's always difficult with him and you know the battle will be very hard, but I was confident that I was competitive and I wanted to try for victory. In the last laps I pushed a lot and I arrived at the last chicane when Marc tried to overtake but he arrived a little bit too late, I was already into the chicane and we touched a little bit and I had to cut the corner. Essentially I had no choice and I was lucky, because I got on the gravel, but I stayed on the throttle even though I didn't know how deep it was and I thought there was a chance I could lose control. When I returned to the track I checked the position of Marc, but he had slowed down more than I did. It has been a great weekend and it's very important because I increased my point advantage over Jorge. I think that in a championship as close as this, it is very important you take the maximum profit when you are competitive and when you like the track, because for sure we will have some more difficult moments. It was fantastic to come back here with a victory. I think we deleted the results of Jerez, where Jorge gained nine points over me and now we have to try to delete also Mugello's results where he did the same thing. Apart from the joke, it is very important because Jorge did fantastic to cut down a 28 points gap to just one. So to take nine points now is crucial, also because I think this championship will arrive to the last race and the last lap." Check out the Full Race Results and the latest MotoGP™ World ChampionshipPoints Standings. The Calendar Motorcycle Show features many of the world's top Pro and Amateur custom street bike builders in attendance with their newest 2-wheeled creations of rolling art to compete in the Calendar Show Bike Building Championship for cash and awards including the coveted Best of Show Trophy. 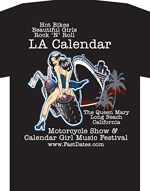 The Calendar Show provides a broad focus for all motorcycle enthusiasts including the growing Collector Bike Market with Exhibitors and Bike Show classes for classic European, British and Japanese motorcycles, along with American V-Twins and Customs. 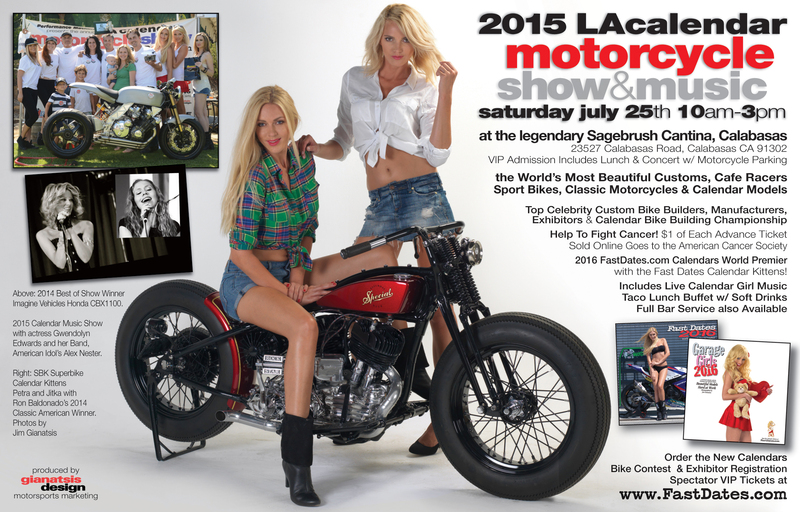 Show Entries will be placed in a Concourse display on the Cantina's large outdoor event patio. Beautiful Fast Dates Calendar Kittens Sara Horvath, Rebekah Davis and Leanna Bartlett make up the perfect pit crew and ridding buddies. Sara is also featured in a her own Pictorial and in the FAST 2015 Calendar Magazine in Members Corner. SYKES AND REA SHARE RACE WINS AT MISANOJUne 21st - First Tom Sykes (KRT) and then championship leader Jonathan Rea (KRT) scored race victories at the eighth round of the FIM Superbike World Championship at Misano today, Rea leaving with an extended lead of 133 points over his team-mate in the overall standings. 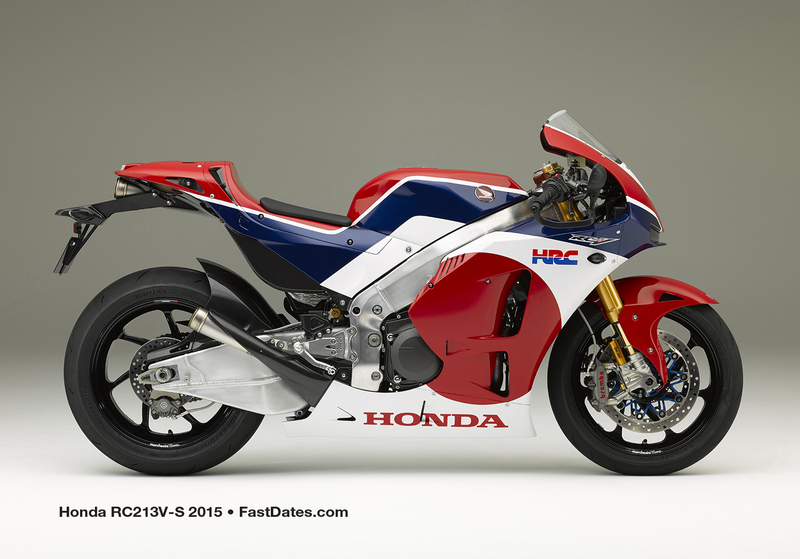 The next race takes place at Laguna Seca, in the USA, on July 19th. 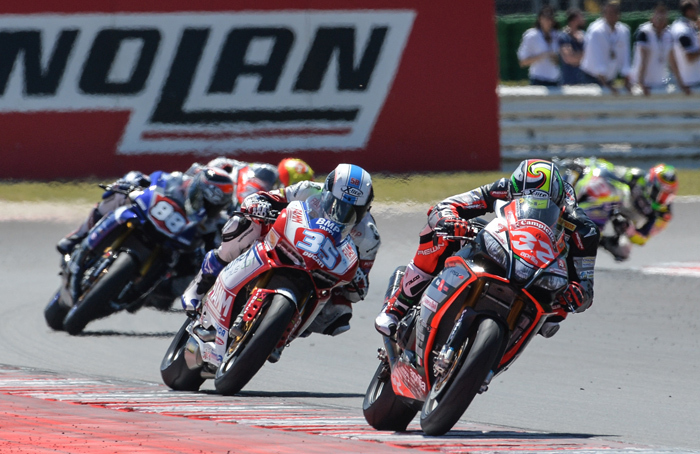 Misano, June 21st - Pata Honda riders Sylvain Guintoli and Michael van der Mark finished in ninth and tenth places respectively in both races at today’s eighth-round World Superbike championship event at Misano World Circuit in Italy. 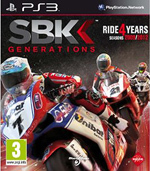 The races at the 4.226km circuit were won by Tom Sykes and Jonathan Rea. Guintoli enjoyed good starts in both races but, despite running as high as seventh in the early stages, the French rider was unable to hook up with the leading groups, instead becoming embroiled in battles with local rider Ayrton Badovini and his own Pata Honda team-mate, van der Mark. For van der Mark, a grid position of 15th following problems during qualifying yesterday was a difficult place to start the two 21-lap races. However, the 22-year-old Dutch rider enjoyed flying starts in both outings, with an intermittent electrical issue hindering his progress in the opening race. Sylvain Guintoli, 9th & 9th - "I had to fight hard today in both races; all I saw on my board was +0 – I was being hunted down by everyone! In race one, with the colder track, we had some significant tyre wear in the second half of the race and the rhythm went a little. Race two was more consistent but we’re still missing some pace from the guys at the front. I gave everything I could today and won my personal battles in each race. We have a bit of time now before the next race to try to make some different plans and strategies for the second half of the season, but we need to find something because there is still some pace missing." Michael Van de mark,10th, 10th - In race one I had a really good start and made up some places early on. I had a good feeling and was quite fast, closing the gap to the guys in front of me. I passed Sylvain but then I had an issue which seems to have happened quite a lot this season. In the end I finished 10th just behind Sylvain, which was quite disappointing. I got another good start in race two but I was missing a lot of grip from the start. It was difficult to maintain the lap times but in the last couple of laps I was able to close the gap again to Sylvain and had a nice battle with him and Badovini. Sylvain passed Badovini and I went with him and I wanted to attack in the last lap but he was strong and in the end he finished in front of me. I think this is the best we can do at the moment because we are both doing very similar lap times. 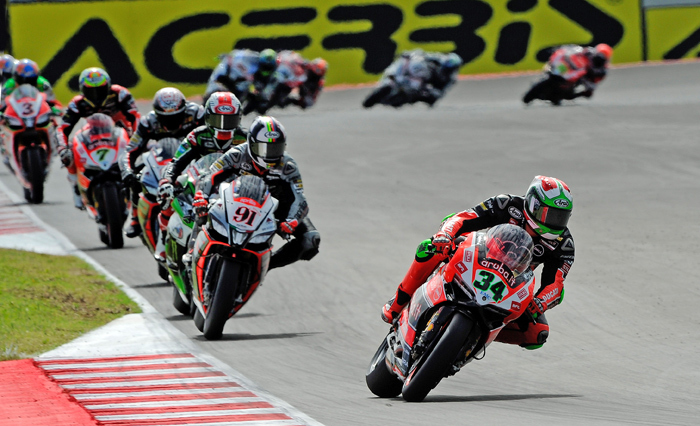 Misano Adriatico (Italy), Sunday 21 June 2015 – Great results for the Aruba.it Racing - Ducati Superbike Team, racing in Round 8 of the Superbike World Championship at the Misano World Circuit. Second and fourth for Giugliano, third and fourth for Davies, and two eighth place finishes for Pirro at his first World Superbike event of the season. Race 1 – race one took place in warm and sunny conditions. Giugliano, from third on the grid, was lying second through the opening laps, positioned behind Sykes. On lap three, the Roman rider set a new lap record thanks to a very impressive 1.34'855. Retaining second position until two laps from the end, a drop in tyre performance slowed him down and, reached by both Rea and Davies in the final phase, the Italian had to be satisfied with final fourth position. Thanks to his very fast pace, Chaz, 11th on the grid, used the opening laps to cut his way through the field, moving into fourth place by lap seven. On lap sixteen he reached Rea, at which point both riders gave chase to Giugliano, battling amongst themselves before passing the Italian in the final stages. Davies therefore crossed the line in third place, followed by his teammate Giugliano, fourth. The podium achieved today by Davies is particularly significant as it brings the number of podiums scored by Ducati to an incredible total of 800. Having started the race tenth, Pirro lost a little ground at the start but a solid pace allowed him to make up several positions, moving from fourteenth to tenth by mid-race. Continuing to push, he was also able to pass VD Mark and Guintoli in the second half, meaning that the Italian wildcard concluded this first race in eighth place. Race 2 – in race 2 Davide wasted no time in catching up to and then passing leader Sykes, taking command on lap seven. He remained in front until the fifteenth lap when Rea found a way past time. The Roman nevertheless continued to fight but a lack of grip in the later stages prevented him from scoring the win, meaning that Davide crossed the line in final second position. Chaz made an excellent start, immediately making up seven positions to place fourth after just one lap. Fighting first with Sykes, then with Haslam, the Welshman pushed hard for a podium finish but this time he had to settle for fourth place, crossing the line less than a tenth of a second behind Haslam, third. Pirro again lost out somewhat at the start but, as he had done in race 1, he was able to make up a lot of lost ground in the space of just a few laps. A constant pace saw him move into eighth place by the mid-race point, a position he was able to hold all the way to the line. This means that as round 8 of the 2015 championship draws to its conclusion, Davies retains fourth place in the overall standings, with 213 points, while Giugliano moves up into seventh place, having earned 106 points. Pirro, having scored 16 points today, lies 21st in the standings. Ducati holds second position in the manufacturer’s standings with 268 points. Orleans Hotel & Casino in Las Vegas to play host to 2015 AMA Pro Flat Track finale and inaugural Superprestigio of the Americas. June 8th 2015 - On the heels of a spectacular debut for the sport in Harley-Davidson Flat Track Racing at X Games, AMA Pro Racing has announced that the world's premier flat track motorcycle racing series will end the 2015 season in grand fashion. The Orleans Hotel & Casino in Las Vegas, Nev. will play host to the 2015 AMA Pro Flat Track Finale on Friday, November 20, followed by the inaugural running of the Superprestigio of the Americas on Saturday, November 21. The pair of short track races will be promoted by industry veteran Steve McLaughlin and held on a circuit designed by seven-time Grand National Champion Chris Carr. "We're pleased to be ending our season in America's home for entertainment and in conjunction with such a prestigious event," said Michael Gentry, Chief Operating Officer of AMA Pro Racing. "Fans can expect incredible excitement both on and off the race track as we crown the next GNC2 and Grand National Champions." Superprestigio of the Americas will be modeled after the pair of highly successful Superprestigio short track exhibition races held last year in Barcelona, Spain. A vision of RPM Racing's Jaime Alguersuari, the original Superprestigio concept pitted top motorcycle Grand Prix competitors such as Marc Márquez and Tito Rabat against the best riders from nearly every form of motorcycle racing in the world, including an AMA Pro Flat Track contingent of Brad Baker, Jared Mees and Shayna Texter. Superprestigio of the Americas will carry the flame stateside, keeping with the spirit of the original but with a few American twists. "Like many things in the states, we're going to do some things a little differently with the Superprestigio of the Americas," said Steve McLaughlin, CEO of SMI. 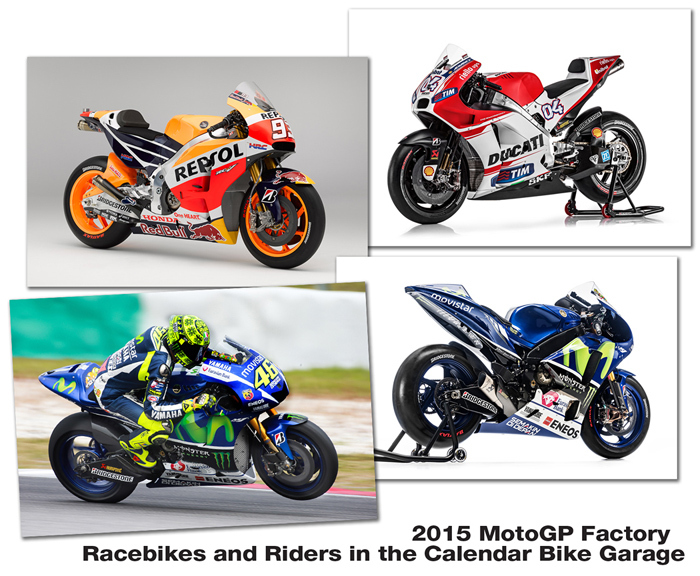 "We're not just going to feature road racers and dirt trackers, this is going to be an invitational event for champions and top riders from all forms of motorcycle racing throughout the Americas. There might even be some interest from Supercross, Motocross, Freestyle, Supermotard and Speedway riders, and we would certainly welcome their participation. It's all about broadening the appeal base of the sport, and we're real excited about this opportunity." The Pomona Half-Mile, previously planned as the season finale on October 10, has been canceled due to the permanent closure of the racing circuit at the LA County Fairplex. "Despite our best and continued efforts, we were unable to save the historic Pomona Half-Mile event for 2015," said Chris Morgan of The Activation Group and event co-promoter. "We are working on some very exciting possibilities for 2016 and hope to bring dirt track racing back to Southern California in the near future. We would like to thank all of our great partners, sponsors, and most of all the Flat Track fans for their years of support for the Law Tigers AMA Pro Flat Track Finals at LA Fairplex." Next up, AMA Pro Flat Track heads to Hagerstown, Md. for the Hagerstown Half-Mile on June 20. For tickets and information, please visit HagerstownSpeedway.com. Every round of the AMA Pro Flat Track season is available for live streaming in high definition at http://www.FansChoice.tv. November 21, 2015 - Superprestigio of the Americas - Las Vegas, Nev.
Movistar Yamaha MotoGP rider Valentino Rossi came out victorious today after a stunning race at TT Circuit Assen, that was decided in the final meters before the flag. 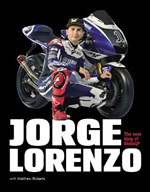 Teammate Jorge Lorenzo also gave a strong performance to secure third. 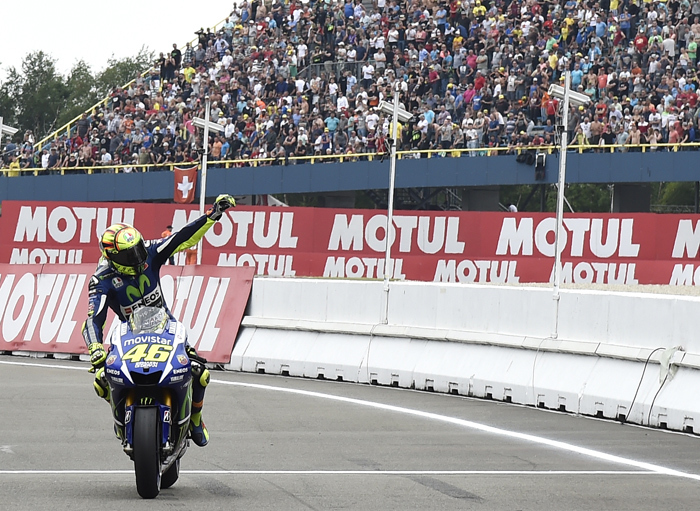 Movistar Yamaha MotoGP's Valentino Rossi completed a perfect weekend at the TT Assen with an impeccable victory, the 111th in his career and his third of the 2015 season. Teammate Jorge Lorenzo also did a superb job at the overcast but dry track, coming from eighth on the grid, to take Yamaha to its fifth double podium of the season. 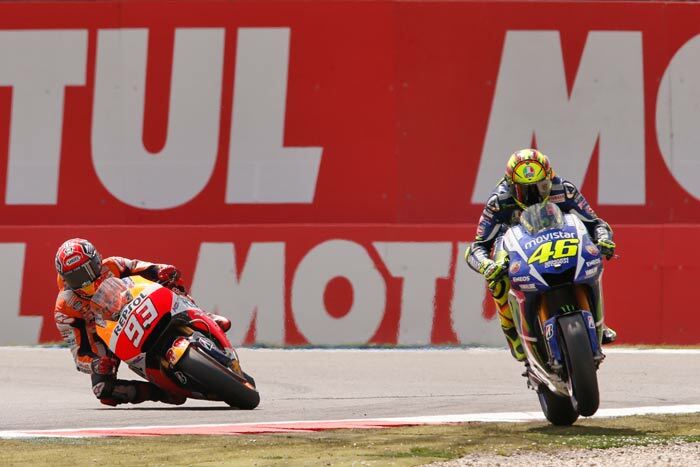 Valentino Rossi kicked off the Dutch Grand Prix from pole with a dream start to take the holeshot. He held a 0,426 advantage to Marc Marquez after the first lap. The Doctor tried to break away from his encroaching rival and the rapidly approaching Lorenzo and responded by dipping under the previous lap record, but was unable to shake his pursuers off. Rossi had Marquez on his tail by lap four, but used his YZR-M1's nimble nature to the fullest to keep him at bay. He held on to his position until the Spaniard made his move going into turn one with seven laps to go, but the Doctor was far from defeated. 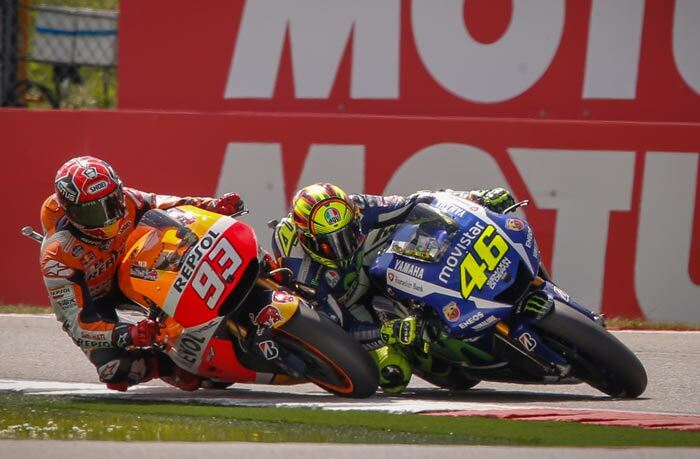 Refusing to let his rival go he stuck close to Marquez and bided his time for four laps before retaking the lead. The following laps had the fans on the edge of their seat. Valentino rode a personal best time on the penultimate lap of 1'33.673 to create a margin, but Marquez closed in on him in the second half of the last lap. The crowd went wild when the Spaniard made his move going into the chicane for the final time clipping the side of the YZR-M1 and forcing Rossi to run straight through a patch of gravel. The Italian did well to hold on to the bike and reentered the track in front of his rival to take his third win of the season with a 1.242s advantage. It was a lonely race for teammate Jorge Lorenzo. Starting from eighth on the grid he flew off the line, taking fifth in the first corner. With his teammate in his sights he had an incredible first lap and started to claw his way to the front. He overtook Aleix Espargarò and Pol Espargarò to finish the first lap in third, but the passes cost him valuable time. The Spaniard put his head down to close the gap to Marquez in second place, but was unable to join the front-runners. With no other riders to spar with, he focused on managing the gap to the rider in fourth place and crossed the line 14.576s behind his teammate, claiming his fifth podium in a row. The results see Rossi hold on to the lead in the championship with a 163 points total. He is now ten points ahead of teammate Lorenzo in second place. There is little time for Rossi to recover from today's epic battle; he will be heading straight to the United Kingdom for the Goodwood Festival of Speed this evening and tomorrow. After this prestigious event, Movistar Yamaha MotoGP will move on to Germany for the next round at Sachsenring in two weeks' time.